My interest in natural history started with birds – their form, color, shapes, and diversity fascinated me! But then in 1981 I got my Newcomb’s Wildflower Guide and that was all she wrote! Plants were my new love – like birds, there was form, color, shape, and diversity; unlike birds, they kept still! I could take my time and make sure that my identifications were correct. As I learned plants I realized how much we didn’t know and I cherished my chance to contribute to the knowledge base. 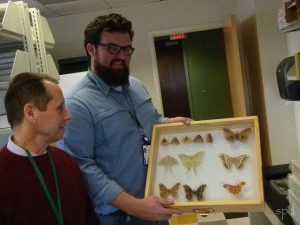 Discovering state records and species new to science was yet another motivator. Being lucky enough to be a botanist with the Virginia Natural Heritage Program was icing on the botanical cake. Then came moths – form, color, shapes, diversity galore. Even more so than with birds or plants, we know next to nothing about these mysterious, mostly nocturnal insects. In 1996, after baiting a tree trunk to attract moths, I was absolutely hooked. The Buck Moth, (Hemileuca maia), caterpillars feed primarily on oak, (Quercus) species. Eacles imperialis, the Imperial Moth. Caterpillar hosts are: conifers and deciduous trees and shrubs including pine (Pinus), oak (Quercus), box elder (Acer negundo), maples (Acer), sweet gum (Liquidambar styraciflua), and sassafras (Sassafras albidum). 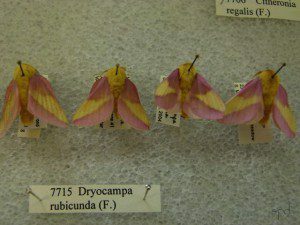 The Rosy Apple Moth, (Dryocamp rubicunda), Maple trees including red maple (Acer rubrum), sugar maple (A. saccharum), and silver maple (A. saccharinum); and oak trees including turkey oak (Quercus laevis). Baiting? This is where you take a fermented mixture of beer/sugar/fruit and generously paint a tree trunk with the thick concoction. On one cool October night, I painted a few trees on my 10 acres in Hanover County, Virginia, and no fewer than seven large, interesting moths found the mix in less than an hour. From then on I couldn’t get enough. Most evenings I would bait and run lights to attract moths to my house. At the end of five years, I had found nearly 600 species on my Hanover County 10 acres! Fortuitously, my interest mirrored the interest by Virginia Heritage, and our zoologist, Steve Roble. 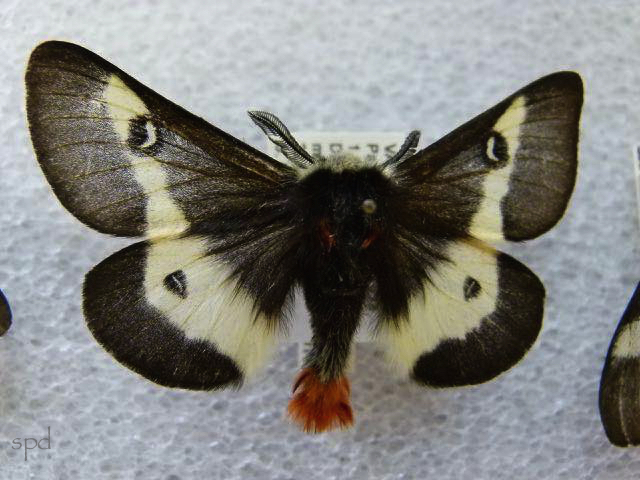 Since the late 1990s we have built a wonderful collection and database of moths. We are beginning to get a handle on the fauna and learn what is rare and most in need of conservation. It is a long process! Why offer this post to the Native Plant Society? As some of you may know, some moths are entirely dependent on one or just a few species of plants, and I want to close this entry with a bit about the “borer moths” in the genus Papaipema. 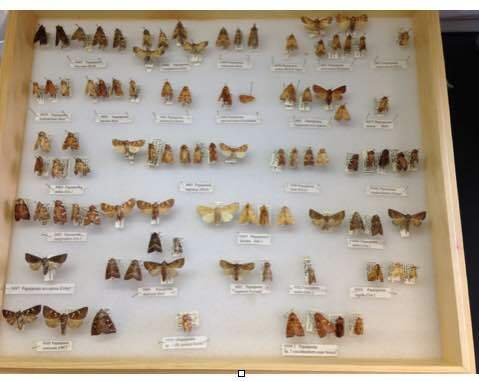 This is a picture of almost all of the Virginia species from our collection at the Virginia Natural Heritage Program. A few of these species are generalists, but most seek members of a particular genus or family of plants on which to lay their eggs. The eggs hatch and the larva puncture the plant and feed on the plant from inside the stem – thus the name “borer moth”. I will finish with a few scientific names – see if you can guess which of our plants these moths prefer? Papaipema araliae, Papaipema baptisiae, Papaipema eupatorii, Papaipema lysimachiae, Papaipema polymniae. Fascinating article. So important to know that many moths are specialists and rely on specific plants – it’s not just the monarchs! Very well written article. 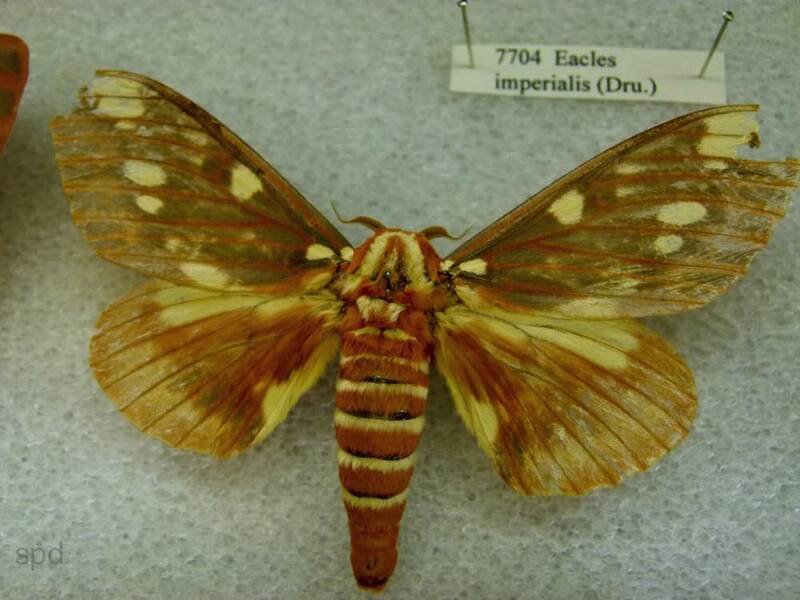 It is intriguing that moths are dependent on only certain species of plants. I’m also quite amazed at your quote, “At the end of five years, I had found nearly 600 species on my Hanover County 10 acres!”. Wow! It is amazing this many different species can be found so relatively close together. Thank you for sharing!